The untimely passing of a loved one is an incredibly difficult burden to bear, especially if they were taken from you unexpectedly and as the result of another person's negligence. The sad reality is that preventable accidents happen every day throughout St. Louis, throughout Missouri, and throughout the entire United States; too often these accidents prove fatal. The CDC reports an average of about 126,000 accidental injury-related deaths annually in the US, making it the 5th leading cause of death nationally. The tragic deaths leave behind grieving family members in need of both emotional and financial support, and we want you to know that our team of attorneys is here to help. If you've lost a family member in an accident that you believe was someone else's fault, we urge you to contact us to learn more about potential legal action that may be available to you. What Qualifies as “Wrongful Death”? Typically, a “wrongful death” is defined as any death that can be attributed to the actions (or non-action) or negligence of another person or entity. If another party is found to be responsible for the death of an individual, the deceased person's heirs and beneficiaries may be eligible for compensation for damages, lost future income, and more. It's important to point out that wrongful death cases are governed by state statutes, and as a result, the particulars of exactly whom is eligible to file a suit vary from state to state. In Missouri, the surviving spouse, children, grandchildren (and in some cases, parents) are eligible to file a suit on behalf of the deceased. If there is no spouse or children, a surviving sibling may file the case. There are other eligible parties in certain circumstances, including estate executors and others, but immediate family members are the most common filers of Missouri wrongful death cases. Generally speaking, the majority of wrongful deaths are caused by accidents. Car accidents and medical malpractice are common causes, but so too are occupational hazards such as dangerous conditions or exposure to harmful chemicals, criminal action, and many other occurences. The bottom line is this: if the death was a result of “...any act, conduct, occurence, transaction, or circumstance, which, if death had not ensued, would have entitled such person to recover damages in respect thereof”, it may be categorized as wrongful death under Missouri law. What Does a Wrongful Death Claim Seek to Accomplish? “Lost companionship” and damages for other similar intangible factors. The loss of a loved one is tragic enough. You don't need to also suffer financially; hold those responsible accountable for their actions. There is a 3 year window during which you can file a claim, so your time is not unlimited. Contact us today to see if you have a viable claim. 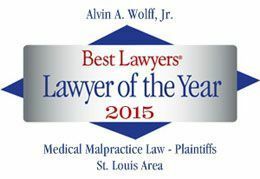 Here at the Law Offices of Wolff & Wolff Trial Lawyers, we know just how trying this time can be for your and your family. We have a demonstrated record of success, and have handled cases similar to yours before. We serve the entire St. Louis region and beyond. Contact us at 314-241-2500 to learn more about how we can help you, or to schedule a free consultation with our wrongful death attorneys.